A waterfall is a fun way to accent a custom pool and add some additional beauty to your backyard. A waterfall is a fun way to accent a custom pool and add some additional beauty to your backyard. Waterfalls create a stunning focal point in backyards of every size, and they are also functional and practical parts of a custom pool. Having trouble deciding whether or not to add one to your pool? Here’s what you should know! Algae is a major problem for many pool owners, and waterfalls help to stop it from growing. If water is constantly in motion or in use, algae will typically not grow or flourish. 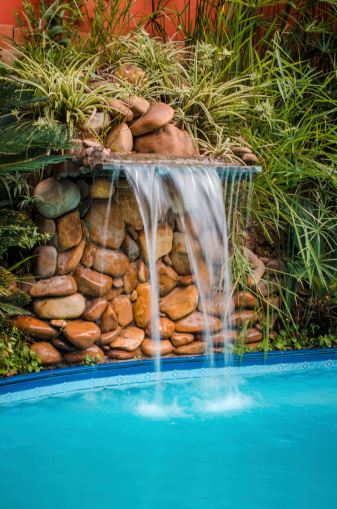 Therefore, adding a waterfall to your custom pool will cut down on algae growth. Waterfalls are a great accidental solution to an algae problem! Water filtration is critical for pools, especially if you have young children. While you should still have a quality pool filter, waterfalls can provide additional filtration. When the water is circulating through the filters and pool more quickly, it will be cleaner. Waterfalls create lovely white noise for afternoons spent reading on the patio or napping by the pool. If you love the sound of water or white noise while you sleep, a waterfall is a unique way of adding it to your yard. Waterfalls are particularly great if you use your pool or spa area primarily for relaxation, as you will feel like you are spending time in a luxury spa instead of your backyard! 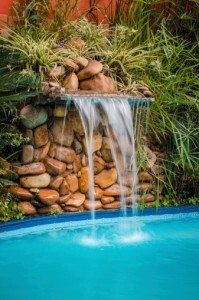 Finally, pool waterfalls add a tremendous amount of curb appeal to your home, landscaping, and hardscaping. They take a traditional pool to the next level, and many prospective homebuyers will be impressed at the beauty of the finished product. This entry was posted on Friday, November 10th, 2017 at 9:04 am. Both comments and pings are currently closed.